2015 showed strong growth in the popularity of spas and hot tubs. What might be driving that is impossible to tell from this survey, however, it does seem that hot tubs have been getting more and better coverage in the mainstream media recently. Newspaper articles have talked about spas in regard to how lottery winners might spend their money, luxury items that people most aspire to and what you might expect to find at your perfect holiday cottage. That will certainly all have helped. The spa will probably always be the wet leisure industry’s highest volume product but this year’s figures are impressive. The average number of spas sold by respondents is 20% up on last year’s figures. While spa sales have steadily increased over the last few years, the number of above-ground pool installations has gone down. Perhaps we need a few good summers to get them back on to people’s shopping lists. As they did last year, almost 50% of businesses that ticked ‘other’ clarified their response by saying that they were installing steam rooms and steam showers. As the pool, spa and sauna sectors become increasingly difficult to separate, so some market trends become common to the entire industry. 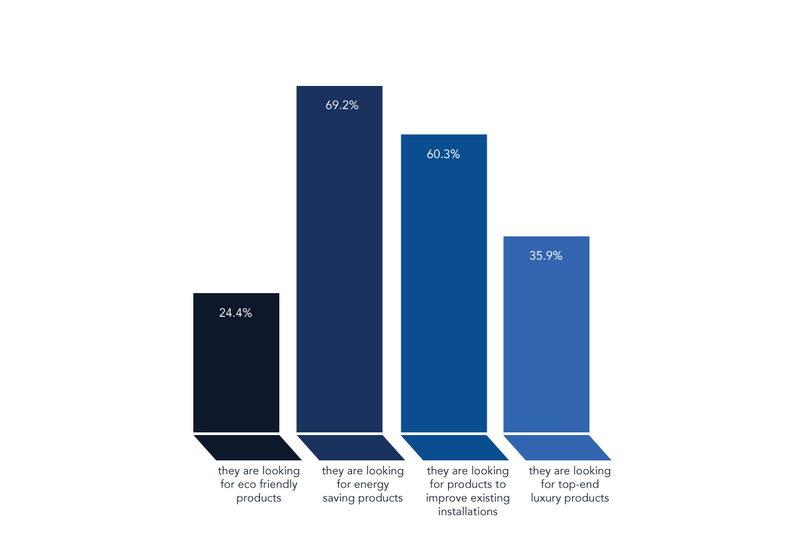 This question was first included in the survey in 2013 and energy saving products have consistently come out on top with the retrofit market a close second. When respondents were asked for further comments, then price came out as a strong issue.